The Spitak Helsinki Group staff. In the center is SHG President, Ashken Babayan. 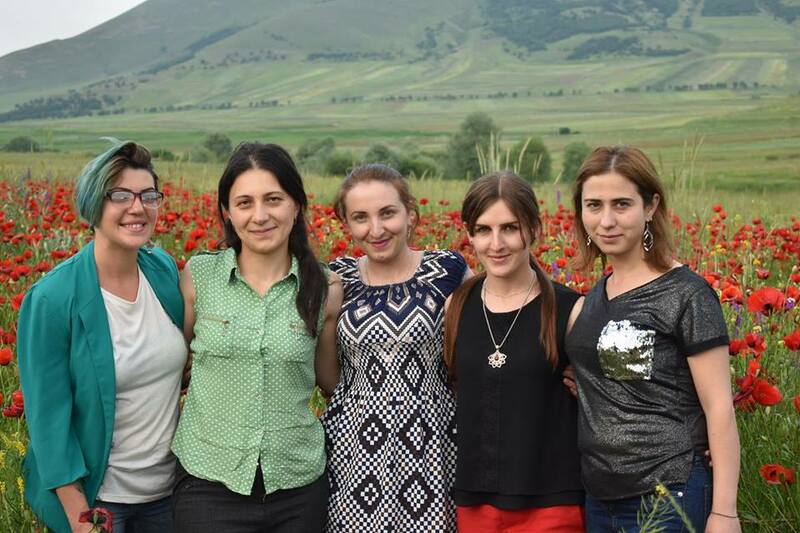 In 2015, the Near East Foundation UK launched efforts to advance gender equality and the rights of survivors of gender-based violence (GBV) in Armenia. 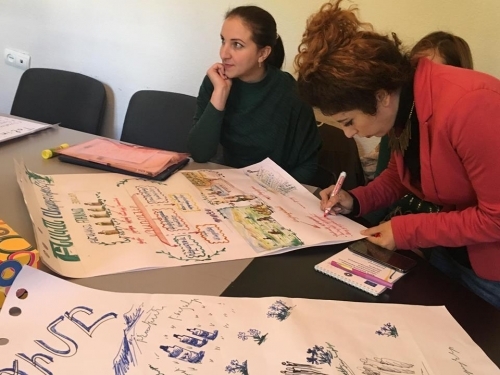 NEF selected four local civil society organizations (CSOs) in Armenia to build and strengthen their capacity to deliver economic empowerment opportunities to local women who have been victims of GBV. This work continues as NEF pursues efforts to assist twelve civil society organizations in establishing social enterprises that will provide a sustainable source of funding for their programs. Spitak Helsinki Group NGO (SHG), a Lori-based organization was one of the four original CSOs that benefited from these efforts. ‘’When we got involved with the project, we had no employees and no sustainable partners. We were working mainly with the support and involvement of volunteers. Partnering with NEF had crucial and strategic significance for our organization’’ says Ashkhen Babayan, the President of SHG. Through training and guidance from NEF, SHG went through the process of reviewing its management structure, electing a new board, and developing updated organizational policies, procedures, and operational toolkits. With these operational improvements in place, SGH was able to help over 50 beneficiaries start small businesses and achieve financial independence as well as assist over 20 women with finding jobs in the labor market. Through networking events and community meetings, SHG strengthened cooperation with governmental and non-state organizations, playing the role of connector among local stakeholders. All these activities helped increase their profile in Spitak and increase the number of beneficiaries they were able to reach by over 200 people. “These interventions helped the organizations who participated operate on their highest level of efficiency. The enthusiastic team at SHG was ready to do the hard work and make the most of the opportunities being offered in order to become change-makers for the people they serve. Beneficiaries of SHG trust the organization and regard them as a big family. We really appreciate our partnership with Spitak Helsinki Group’’ concludes Arpine Baghdoyan, NEF’s Country Director in Armenia and the Project Manager. Now, after two years since the end of the program, SHG has five full time staff members and a clear strategic direction—women’s and children’s rights and protection. They have a new energy and are motivated to take the lead on new efforts in the community. NEF’s work to build the capacity of CSO’s who focus on empowering women continues. Its current EU-Armenia funded efforts are working with SHG and eleven other CSO’s to help them establish social enterprises in order to gain financial sustainability and improve the quality and reach of the services and programs they offer.